Before there was Pino’s, the popular Pine family barber shop on King Street, and before Jeff Scott, there was the forerunner institution located at the corner of Berkeley Street and East Canal. 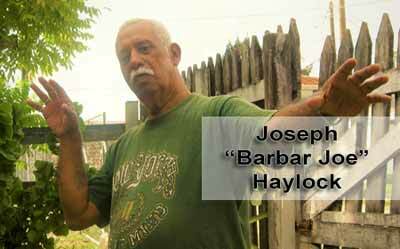 The legendary Joseph Haylock, popularly known as “Barber Joe,” was the quintessential elder when Belize City’s Southside had authentic neighborhoods where families lived on the same streets for generations and we were civilized toward each other. The story of Barber Joe and his small business is a narrative of what we have lost over the past few decades, much like the neighborhood “mom and pop” family grocery stores that once dotted our communities. Barber Joe began cutting hair as a young boy at St. Ignatius Primary School on Belize City’s Southside where his talent did not go unnoticed. Some of his teachers were among his first clients at the school he attended. Since there is no barber school in Belize where a student can master the trade, he learned and perfected his craft from those brave enough to volunteer for haircuts. By the time he became a young man, Joseph Haylock had established himself as one of Belize’s most celebrated and loved community barbers. On Berkeley Street at the corner of East Canal stood a small wooden structure that housed his workshop. Besides his obvious barbering skills, most importantly Barber Joe is a brilliant Belizean folklorist who tells his stories in an animated exuberance in a colloquial and colorful rhythmic witty flow, without a script. A natural vocalist with a baritone depth, he would sometime croon the likes of Nat King Cole originals while cutting hair. Barber Joe is one of the funniest men I have known; he could bring a smile and laughter to your face no matter the difficulty you were facing in life. This natural talent would explain why his barber shop was so popular because it was a refuge and sanctum where professionals, political leaders, business people and ordinary people would gather, where artificial social lines diminished, even if only for a moment, in that space where Haylock would be the star and center of attention on his stage. He told stories such as that of a neighbor who switched political parties from UDP to PUP, but his pet parrot had difficulty making the transition and remained a loyal UDP: the bird could be heard by passersby joyfully reciting, “UDP, UDP, UDP all the way” to the disgust of the owner. Or the time when a man became intoxicated to the point where he couldn’t distinguish between his mother and a wheelbarrow. Another time while Joe was heading to the marketplace a group of baseboys in front of “Bonfire” on Albert Street inquired where was he going. Joe’s response? To find a rhinoceros tail to make fish tea. Such quick wit was classic Barber Joe that was met with outbursts of laughter that made him popular among both the young and old. The only other Belizean of his generation with such natural talent of wittiness I could compare Haylock with, was the late, great radio personality, Edison “Seferino” Coleman. It was in this sanctuary I was brought as a small, scared child to experience my first haircut, as it was told to me by Barber Joe himself. Thus began a relationship that continued into my adulthood. As a young boy, I would sit among the grown men and eavesdrop on their banter as I waited for my turn in the barber chair, usually on a Saturday. I was not specifically told not to say anything, but the demeanor of these men would let me know this was grown men’s conversation. Barber Joe was a big boxing fan and this was a favorite subject of his where he could be considered a local expert. He knew all the stories of early boxing in Belize. The great Muhammad Ali was his idol and Ali’s pictures adorned the walls of his barber shop. The subjects include every conceivable topic one can imagine, while a bottle of “perique,” a concoction of local rum mixed with natural milk and ginger wine, made its rounds among the adult men present. Drinking as a form of socialization, primarily among Belizean adult males on the weekends, has its roots that date back to the slave mahogany camps in the settlement when the slaves were given a temporary reprieve from the intense manual labor. For a time Barber Joe struggled, like many of his contemporaries, with the consumption of alcohol, but he would eventually stop drinking and find a path forward from the most unlikely source. Among his regular customers were two prominent men who served as Belize’s Deputy Prime Ministers, from two different political parties – Lindbergh Rogers (PUP) and Curl Thompson (UDP). Other luminaries included businessman Dickie Gardiner; George Gabb – Belize’s greatest iconic sculptor; the current Belize Prime Minister’s late father, Mr. Barrow senior, who in his later years became infirm, but upon request Barber Joe would continue to cut his hair on regular visits to the home; “Straker,” a proclaimed son of the legendary businessman Robert Turton; Mr. Gibson, an accountant who was called “Twoson” for some unknown reason; and Melvin Smith, a loan shark. Barber Joe had colorful nicknames for all of the individuals who made up this eclectic mix of customers. The late George Gabb is the uncle of Barber Joe, and both were known to love discussing philosophy, politics, sports and Belizean history. These oral narratives are rarely documented from among our elders and we are in danger of losing them forever. Barber Joe and his wife, Mrs. Cecilia Haylock, lived three houses down from where I grew up on Racecourse Street. I visited the Haylock home often, since I was friends with his son Frankie, and daughters Patricia and Pamela. There on the verandah Mrs. Haylock would serve up homemade Creole bread with slices of roasted deer leg. While this brings some degree of nostalgia, it was indeed the way we were as Belizeans in the late 70’s and early 80’s leading up to Independence. On Friday evenings a group from the neighborhood that included a mix of young teens along with elders that included Barber Joe would attend basketball games and boxing at Birds Isle and movies at the Palace, Majestic and Eden theaters in downtown Belize City. The neighborhood kids loved him. The 70’s and early 80’s were arguably the golden era of sports in Belize. Belize won gold in ladies softball at the Pan American Games in Santo Domingo, epic regional boxing matches rocked Birds Isle and the grassroots base boys sensational creation of the legendary Pulu Lightburn – Happy Homebuilders, rose and destroyed basketball’s corporate teams – Wheels and Coke. It is with this backdrop we younger folks actually wanted, and enjoyed having a senior in our midst. Joe Haylock was like no other, and his presence never made us feel curtailed or confined as energetic youths. His sense of humor elevated the outings and we wouldn’t want it any other way. Whenever any road trips or visits to the cayes on Melvin Smith’s classic Radio lighter were being arranged, Barber Joe was the litmus test, because if he was not interested or had a different destination in mind, that’s where the rest of us would be going – case closed. A trip would simply not be conceivable without him onboard. The verandah played a central role in Belize culture and socialization in the past. It was the place where people met, entertained and found relaxation. Today people flee into their living rooms and seal/lock themselves in at the first glimpse of sunset. Some attribute this change in diminished socialization on the verandah to the arrival of American T.V. along with increased crime and violence. I would argue it began with the arrival of American T.V., which fundamentally changed the way Belizeans congregated and socialized. In any event, the verandah at the Haylock home in the late 70’s and early 80’s was the last flickering of what we have lost as a people and culture. On the verandah, Joe began asking me to recite the Quran to him, which is the book of the Muslims. He would sit and listen, sometimes with his eyes closed, with intense interest and focus as I read out loud to him. His wife and family were content to see their husband and father in this tranquil space rather than out drinking. As I reflect back on those moments, I suppose Barber Joe had always been a student of philosophy and had a keen interest in knowledge and spirituality and became an admirer of the then dynamic and socially active and vibrant Muslim community. Others times everyone would gather around on the verandah to listen to folk tales about the Hattie hurricane, jack ‘o lantern tales, and the haunted Hydes Lane ghost stories in Belize City. These folklores were told with passion and excitement and wittiness. Joe eventually began to attend the Masjid which was just down Racecourse Street about two or three houses away. Barber Joe would say in no uncertain terms that at his age he could never learn Arabic, which is the original language of the Quran. 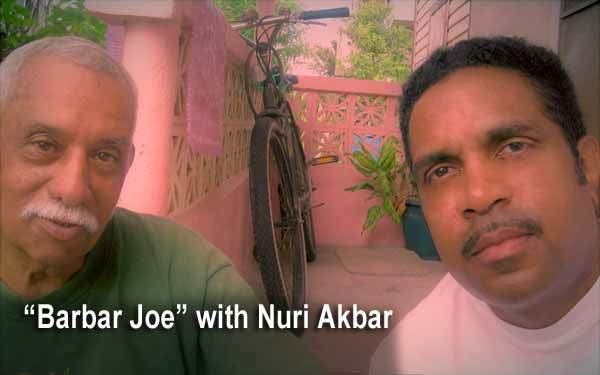 As improbable as this sounds, in the end not only did Barber Joe learn to recite verses of the Quran in Arabic, but he became the most outstanding and sensational “muezzin,” or the individual who called the “adhan” call to prayer for the Muslims, in the history of the Muslim community in Belize. As mentioned earlier, Barber Joe had a natural, powerful singing vocal, and he took the adhan and sent it into the stratosphere that warmed the human heart and soul as it penetrated your very being. As a result, Barber Joe stopped drinking and became a Muslim and was known among the community as Yosef Abdulrahman. Barber Joe’s dear wife, Ms. Cecilia, passed away in 2008 and Joe has since withdrawn and retired from cutting hair full time. Still agile and relatively healthy, he occasionally cuts hair at his new home where he lives next to his daughter Patricia and her husband, Rocky Vasquez. A select few and longtime loyal customers who still seek him out on the Northside of Belize City continue to arrive. I make it a duty to pay him a visit whenever I am in town and soak in this wonderful Belizean elder’s wisdom, as he still dishes out his one liners of folksy observation of Belizean culture, politics, sports and history. I salute you, Barber Joe, and feel that I speak for all those kids who saw you as the grand adopted uncle and for all the fun memories growing up in Belize City’s Southside, and the positive vibes you transmitted back in the day. Lord knows, we need resurrected more positive and constructive interaction between Belize City youth and elders in 2017.